In contrast to the often-asked krill vs. fish oil question, the issue of PUFA vs. SFA seems to be resolved. At least if we focus on replacing SFA with N-6-PUFA well-controlled RCTs don't show a benefit. If studies are interesting, but there's not enough to dissect for a full SuppVersity article, they make it to the short news. Today's installment is a nutrition research update and it deals with (1) the often-asked question whether there's a health- or performance-relevant difference between fish and krill oil, (2) the often-heard advice to replace saturated fats in your diet with omega-6 fats to improve your heart health, an advice of which a new meta-analysis shows quite cleverly that it's an artefact due to the inclusion of insufficiently controlled studies, and (3) using the low-FODMAP diet in athletes to reduce gastrointestinal problems that range from burping to diarrhea. Red Meat a 'No-Go' Only for the Obese? Fish and krill oil - similar, but significantly different - Years ago, in the early days of the SuppVersity I wrote about the "phospholipid advantage" of krill vs. fish oil. While the latter comes in conventional triglycerides, a large percentage of the omega-3 fatty acids in krill oil are already in the preferable phospholipid form that can be readily incorporated into our cells. That's a theoretical advantage, of which a 2013 review by Schuchardt et al. does yet say that it is "often claimed", but eventually hasn't been demonstrated "conclusively". Figure 1: The 4-week double blinded, randomized, placebo-controlled, crossover trial by Ramprasaht et al (2013) is probably the best comparison of the bioavailability of fish and krill oil and it shows significant advantages of krill oil, especially in terms of the health-relevant incorporation of N-3 PUFA in red blood cells. Nevertheless, studies such as Ramprasath et al (2013), which was published after Schuchardt et al. 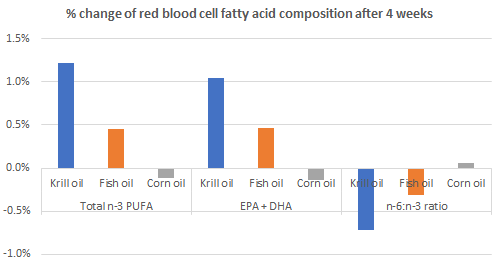 stopped collecting data for their previously cited review seem to confirm that "krill oil could be more effective than fish oil in increasing n-3 PUFA, reducing n-6:n-3 PUFA ratio, and improving the omega-3 index" (Ramprasath 2013). a differential effect of FO and KO on 6 out of the 51 arachidonic acid (AA) molecular species, with KO significantly increasing two and decreased two of these AA species, whereas FO significantly increased one and decreased seven of the AA species. Now that wouldn't be really interesting if one of these arachidonic acid providing phospholipids wasn't a good old friend from the supplement industry: phosphatidylcholine - the stress reducing, highly expensive adaptogen/cortisol modulator. What's the verdict on Fish vs. Krill oil, then? Unfortunately, the biological significance of these changes is almost as elusive as the complex effects of the other changes in arachidonic acid metabolism, of which we have almost no idea if they can health-relevant effects and would warrant switching from cheap fish to significantly more expensive krill oil. Latest meta-analysis exposes shortcomings of previous papers suggesting that replacing saturated fat with omega-6 PUFAs would be heart healthy -- Unfortunately, the recommendation to replace saturated fatty acids (SFA) with mostly n-6 polyunsaturated fatty acids (PUFA) to reduce the risk of coronary heart disease (CHD) is still a cornerstone of conventional dietary advice - advice, of which its advocates claim that it was based on 'many clinical trials and meta-analysis'. This allegedly 'convincing' evidence has yet been questioned by recent meta-analyses of observational studies and clinical trials (Siri-Tarino 2010; Ramsden 2010; Chowdhury 2014; Harcombe 2015; Ramsden 2016). As Steven Hamley points out in a recently published meta-analysis, "earlier meta-analyses did not sufficiently account for major confounding variables that were present in some of those trials" (Hamley 2017). That's a bummer, a major bummer as Hamley's re-analysis of the data shows, because after removing ‘inadequately controlled’ trials, the previously significant advantage in terms of CHD events (-20%, p = 0.03) disappeared. Figure 2: Even when Hamley included all studies (also the non-adequately controlled study), only the risk for total CHD events was significantly reduced. When Hamley analyzed only the adequately controlled study, the risk reductions were not just non-significant, they simply didn't exist (data from Hamley 2017). 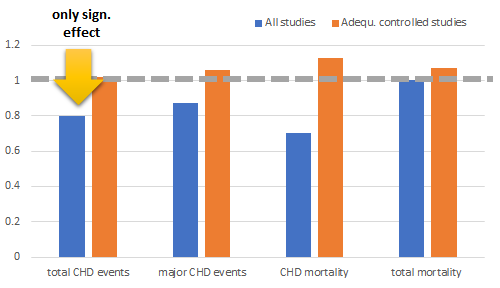 The already non-significant improvements in major CHD events, CHD mortality and total mortality were even reversed - note: since the meta-analysis of adequately controlled studies yielded only non-significant results, that's not grist to the mills of the saturated fat advocates, though. What's the verdict on replacing saturated fat with omega-6 fats, then? If only those trials that controlled adequately for the various dietary and behavioral confounders, the previously reported benefits of replacing SFA with n-6 PUFAs, which are at the basis of contemporary dietary advice, disappear. Low-FODMAP diet may help athletes prevent GI distress -- You've read me write about the potential usefulness of low-FODMAP diets in IBS before. That avoiding oligosaccharide, disaccharide, monosaccharide, and polyols, of which some research shows that they can fuel healthy gut bacteria, should be beneficial for athletes, on the other hand, is news; news that's based on a soon-to-be-published study by Lis et al (2017). Inspired by the promising trials in IBS sufferers, a team of Canadian researchers tried to figure out if avoiding FODMAPS would produce similar reductions in GI distress parameters in runners with a history of non-clinical exercise-associated GI symptoms as it did in recent IBS trials. To this ends, Li et al. recruited eleven recreationally competitive runners (5 males, 6 females; 5km personal best 23:00+/-4:02 min: sec), who were allocated to a randomized 6-day low (LFOD) or high FODMAP (HFOD) diet in a controlled, single-blinded cross-over study. Figure 3: Schematic showing participant selection and study design. LFOD=Low FODMAP diet, HFOD=High FODMAP diet, GI=gastrointestinal, DALDA=Daily Analysis of Life Demands for Athletes (Lis 2017). In each period participants completed two strenuous running sessions consisting of 5x1000m and a 7km threshold run. GI symptoms (during-exercise and daily) and the Daily Analysis of Life Demand for Athletes (DALDA) questionnaires, which monitor the state of well being and mood state, were completed. To measure the effects, the scientists calculated the area under the curve (AUC) for daily GI symptoms across each dietary period and analyzed it using multilevel mixed-effects linear regression to compare the effects of the two isocaloric diets (note: while the LFOD diet was lower in protein and higher in fat, the absolute differences were 5 and 7g and can thus be neglected despite being statistically significant; p = 0.03 and p = 0.003, respectively, what may be more important, though, is the lower GI of LFOD). As you can see in Figure 4, Li et al. 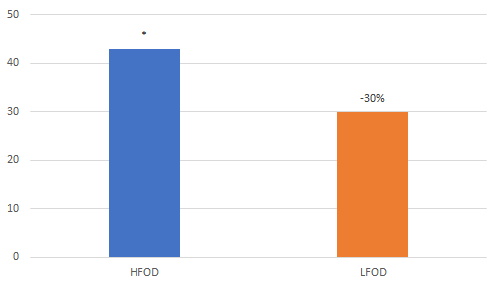 recorded a significantly smaller AUC for daily GI symptoms over the 6-day period during the LFOD compared to HFOD (mean difference -13.4, 95% CI [-22, -4.60], P=0.003). The daily GI symptoms that were significantly lower during LFOD were flatulence (P<0.001), urge to defecate (P=0.04), loose stool (P=0.03) and diarrhea (P=0.004). No significant differences in during exercise symptoms or DALDA responses were observed between diets (p>0.05), however. Remember? 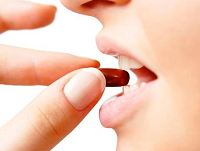 Fish and krill oil also have different epigenetic effect | more. So what's left to say? Well, while the evidence regarding the general advice to replace saturated with omega-6 fats for heart health seems to have finally made the transition from 'convincing' to 'generally flawed' (it may make sense for a certain part of the population), there's still a lot of research due before we can (a) say with some conviction that spending the extra money on krill vs. fish oil is worth it and whether it's (b) advisable for athletes to remove FODMAPs from their diets, in general, or just in those circumstances where people are FODMAP-intolerant | Comment on the studies and the "short news"-format! Chowdhury, Rajiv, et al. "Association of dietary, circulating, and supplement fatty acids with coronary riska systematic review and meta-analysis." Annals of internal medicine 160.6 (2014): 398-406.
de Oliveira, Erick P. "Runner's diarrhea: what is it, what causes it, and how can it be prevented?." Current opinion in gastroenterology 33.1 (2017): 41-46. Harcombe, Zoë, et al. "Evidence from randomised controlled trials did not support the introduction of dietary fat guidelines in 1977 and 1983: a systematic review and meta-analysis." Open heart 2.1 (2015): e000196. Ramsden, Christopher E., et al. "n-6 fatty acid-specific and mixed polyunsaturate dietary interventions have different effects on CHD risk: a meta-analysis of randomised controlled trials." British Journal of Nutrition 104.11 (2010): 1586-1600. Ramsden, Christopher E., et al. "Re-evaluation of the traditional diet-heart hypothesis: analysis of recovered data from Minnesota Coronary Experiment (1968-73)." bmj 353 (2016): i1246. Schuchardt, Jan Philipp, et al. "Incorporation of EPA and DHA into plasma phospholipids in response to different omega-3 fatty acid formulations-a comparative bioavailability study of fish oil vs. krill oil." Lipids in health and disease 10.1 (2011): 145. Schuchardt, Jan Philipp, and Andreas Hahn. 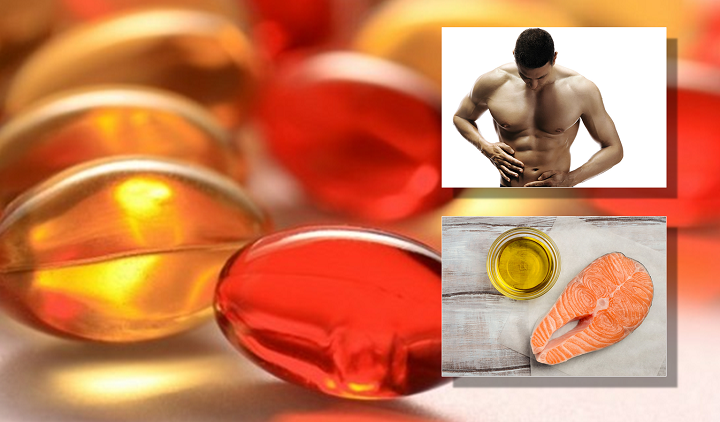 "Bioavailability of long-chain omega-3 fatty acids." Prostaglandins, Leukotrienes and Essential Fatty Acids (PLEFA) 89.1 (2013): 1-8. Siri-Tarino, P. "Meta-analysis of prospective cohort studies evaluating the association of saturated fat with cardiovascular disease. Retrieved June 20, 2015." (2010). Sung, H. H., et al. "Lipidomic profiles after a 30-day krill oil supplementation compared with fish oil in healthy women." Journal of Nutrition & Intermediary Metabolism 8 (2017): 83-84.